Irene Li co-owns and operates the Boston-based food truck, restaurant and shipping container enterprise collectively known as the Mei Mei Group. Founded with her two older siblings, their award-winning food businesses merge modern techniques and genre-bending creativity with sustainable practices and tech-savvy communications. Their work has been featured by Food & Wine, Eater Boston & National, The New York Times, Restaurant Hospitality, People, Bon Appetit, The Boston Globe, and more. Irene believes food can and should be delicious, fun, and just. Her background of living on an organic farm, working the restaurant line, and organizing for social justice inform her leadership of the food and sourcing elements of the company. 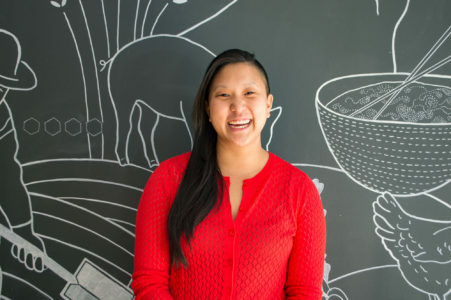 She recently graduated from Cornell University with a BA in Food Systems and Cultural Studies, received her third consecutive James Beard Rising Star nomination, and an Eater National Young Gun award. How/why did you get involved with Lovin’ Spoonfuls? We first got involved with Lovin’ Spoonfuls in 2013 as part of Brian Mercury’s OverKill benefit dinner. We had such a great time with the other chefs and with the guests, it was a no-brainer to sign on for the Tailgate and other events. It’s a treat to get to do what we love (cook and feed people!) to benefit an important cause that’s so intimately connected to cooking and providing nourishment for people. When Ashley first invited us to participate in the Plenty workshop series, I was super honored! Growing up in Boston, I learned pretty early on that even within this city I love, there’s significant inequality in both resources and access when it comes to food. I’ve never gone hungry; yet there are so many near me who do. It’s a privilege to cook and serve upscale food, and making time to give back is my way of addressing that privilege. It’s hard to look at grocery stores and restaurants where food is so abundant and to imagine that there are neighborhoods nearby where you’d have to walk a mile or more for a fresh fruit or vegetable. What I love most about LS’ mission is that it shines a light on issues that are invisible to many of us – hunger, food waste, health & nutrition – and works to capture and divert resources that already exist within our community. It’s an elegant approach to a complex problem and provides all of us with a way to give back. What’s your favorite food? Favorite way to use leftovers? I really love brassicas – broccoli, cabbage, Brussels sprouts, etc, slightly burned or charred with lots of salt. It’s kind of a typical kitchen snack when I’m on the line. My favorite way to use leftovers is to make fried rice. Growing up, I could come home at any time of the day and there would be rice in the cooker on the counter. So I could grab some scallions, a couple eggs, and whatever else was available in the fridge and have a comforting, filling snack. I still love doing that! The Plenty workshops have been the highlight of my relationship with LS. It’s really great to get actual face time with some of the families, young mothers, and seniors whom LS serves – it makes the problem of food access really tangible. Plus, I love talking about cooking – I’m all about strategies and shortcuts that make cooking more accessible to folks at home. I’m not big on recipes or kitchen orthodoxy and I love encouraging people to just have fun and follow their hearts – experiment with that kohlrabi! Sure, grate up that beet! Cooking intimidates lots of people, but as far as I’m concerned, it doesn’t matter if you do it “right” as long as you’re enjoying the experience and end up with something to eat. More broadly, I love that the Plenty workshops are centered less around service provision (which is obviously important) and focus instead on empowerment and capacity building. It’s so cool to see people get visibly excited about a new technique or ingredient, and it’s my hope that some of what we talk about in workshops stays with them through their adventures in the kitchen. I get asked a lot if Mei Mei is expanding any time soon! I love thinking about our next steps and I love looking at real estate 🙂 but what I’m most excited about this year is a new internal initiative with our team members. We scored a grant from the Workforce Training Fund and are working with an awesome team of consultants to provide Open Book Management training to all members of our staff. We go to class once a week, and everyone learns about how the business works, how to read our financials, and how to tackle various issues. The goal is for everyone to learn to think like a manager and to develop skills that they can apply to any job they have in the future, or even to their personal life and finances. Ultimately, we’re hoping that the business will become more profitable, and we’ve created a profit-sharing plan that will pay out to all members of the team if we meet our target numbers. It’s pretty exciting, and our business has already changed and evolved a lot just three months in. More than anything, I want to be a great employer, and I want our industry to be a great industry to work in. We’re hoping that our partnership with Rethink Restaurants will move us closer to both of those goals.